I’ve always wondered why Coach K is the most hated coach in the country. He runs a squeaky clean program, gives back to his community and profession, is a committed family man, a fervent patriot and a former captain in the Army. He seems, if anything, to be a model American: loyal, honest, hard working, ambitious. I know, I know, when a program maintains a high level of success with a nearly spotless record of conduct, you are hated for your attributes, despised for your lack of corruption. That’s why everyone loved it when the Patriots got caught, and perhaps why Tiger is falling so hard in the media these days. So when people hate Duke, I understand it as a mixture of jealousy and contempt for success. Notre Dame football is sort of the same way (sort of). I can deal with people calling Coach K “Ratface” and comparing him to evil dictators and comically spelling his name wrong (making them look pretty ignorant, of course. Irony!). Just as Duke will continue to win at a high level under Coach K, people will hate him for being just so good. My logical thoughts run askew, however, when I gaze down 15-501 toward Chapel Hill. There resides Roy Williams, one of the country’s best coaches and winner of two national titles at his alma mater. Short pretext: I rarely “disrespect” teams for being good. As a Duke fan, that’d be hypocritical. I hate UNC with a passion, but could I deny Ty Lawson’s speed, Wayne Ellington’s jumper or Hansbrough’s awkward but astounding efficiency? No. I can’t sacrifice credibility by calling UNC’s stars what they aren’t: bad basketball players. (Sadly, Danny Green’s dance skills didn’t make above list). But when I gaze dejectedly from the Dean Dome court to the pastel-blue-clad Williams, my eyes contract with rage and hatred swells from my bowels to my brain, my head gets light and the same burning question bursts from my lips: why does everyone seem to love this man? For Roy Williams is guilty of the same things that makes Coach K the most despised college basketball coach. Here’s a sampling. Remember Roy’s touching story in the Coke ad? That commercial, unlike K’s more direct spots for Chevrolet or Alltel, was forgiven because of its heartwarming message. Roy’s mother worked hard to provide him with a dime so he could buy a Coke (in a old-fashioned glass bottle, mind you) on the way home from school, like his other friends did. As Roy is such an “American Dream” success story, he should be able to take advantage of his fame, and make some money from Coke (although it seems he’s more of a Sprite guy.) He deserves these advertising deals. And that’s fine. But do people think Mike Krzyzewski was born with a silver spoon in his mouth? Hardly. His parents were working class Polish immigrants in Chicago. Coach’s father even changed his name to avoid racial discrimination when looking for jobs. Nevertheless, Coach earned his place at West Point, played for Bobby Knight, and served in the military. That sounds like the American Dream to me. But K’s commercial appearances are slammed as money-grabs. What gives? K and Roy even did an ad for Guitar Hero together! Although Coach Knight stole the show in that one. Coach K works the refs hard. Fact. He also curses liberally during games. Check. But Roy Williams, has been guilty of using foul language as well. While “dadgums” and “frikkin’s” are his go-to phrases, the f-bomb has been to known to slip into his lexicon time and again. He also told Bonnie Bernstein, after losing the 2003 national title game to Syracuse, that he “didn’t give a s*** about North Carolina job”. And apparently, he still loves his KU Jayhawks. These emotional outbursts, of course, are normal. Every coach does it, and some more than others. But hypocrisy runs rampant in the differing perceptions of Roy and K. Roy uses modesty and humility to create his image. (“I’m not the smartest guy around, but I’m not the dumbest either”). By spicing in the occasional curse word amidst all those lovable Southern affectations (“gosh darn it!”), Roy seems like a country boy who happens to be a great coach. K, on the other hand, exudes professionalism and intensity. Could you imagine him doing something like Soulja Roy? It’d be like John McEnroe buying flowers for a line judge: it wouldn’t fit. But the little quirks that makes Roy so popular somehow reflect badly on the business-like Coach K.
One of your pets? Can you imagine the firestorm if Coach K said something like this? Maybe Roy’s “hardness” and shock-and-awe leadership tactics are the key. And that brings me to the final, and perhaps most telling point. Let’s just go straight to the details of this one, shall we? Late in the second half of UNC’s 103-64 romp over Presbyterian this past Saturday, Roy Williams heard a Blue Hose fan shouting at Deon Thompson on the free throw line. The heckler called out “Don’t miss it, Deon!” while the senior forward sank the shot. Coach Williams, upset at an opposing fan shouting at his players at the Dean Dome, had the man ejected from the stadium by police officers. Check out the video below, courtesy of WRAL. Dan Wiederer of the Fayetteville Observer reported that Roy asked security to check if the man was in the correct seat, which he apparently was. The man was removed on suspicion of intoxication that has not been confirmed as of yet. But wait a second—why on earth was Roy so bothered by a single fan, chanting a harmless taunt, while his team was up by 40 points? The Presbyterian Blue Hose now stand at 2-8—hardly a serious opponent or a rivalry game. Roy had no reason to get so fired up. Shouldn’t a coach of an ACC contender focus on his own damn team? This incident is evidence of Roy’s megalomania and absurd shows of power. It’s one thing to call your player a ‘pet,’ or cite Michael Jordan and James Worthy as players better than your struggling freshman. Or to permit your star point guard to gamble on a team trip, or denigrate a former recruit in a book, then in a press conference, for ‘lying to you’ and choosing another school. Those are just coaching moves, right? But to orchestrate the ejection of a harmless fan, especially when your team is dominating, is absolutely over the top! He actually looked at this guy and said, “Yeah, I’m talking to you!” before gesturing towards security. What, did the guy pull a DeNiro? Wiederer’s original blog post wondered how the media would react if Coach K had pulled a similar stunt as Roy. The answer? It wouldn’t have happened. While the cavernous Dean Dome is pretty tame in such cupcake wins (do the wine and cheese make fans sleepy? ), Cameron is loud and rocking for nearly every game. So it’d be hard for K to hear any taunts, innocuous or otherwise. Nor would he react. He’d be too busy, you know, coaching his own damn team. 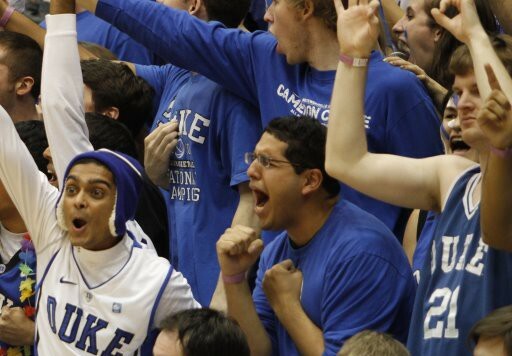 And from personal experience, there are always opposing fans heckling Duke players on the line. My personal favorite was during the Montana game last year when a chubby kid yelled “You will not make the basket” before every Duke foul shot in an eerie monotone. Strange. Is the media coverage of Roy’s mental weakness outburst a chink in his armor? Likely not. UNC fans will go on loving Roy and defending his every move. Like Coach K, he’s brought his supporters wins, banners and discounted Bojangles. Well, they don’t share that last one, but you catch my drift. In a world where fans constantly forgive athletes and coaches for their wrongdoings, it’s nice to support a top-flight program with minimal controversy and an upstanding leader. While Roy continues to make a show of his power, Coach K will continue working hard to win—with class. And remember everyone, when you’re in the Dean Dome, do as the cool people do: shut your mouth, and let the dad gums echo throughout the stadium. Even as an avid Tar Heel fan I can appreciate your points and your well researched, intelligently thought out and comprehensive argument. I agree with most of your points about Roy. I love the guy, think he is a great coach, an even better recruiter and a great guy to have at the head of the UNC program. My biggest disappointment in him, which seems to pop up once a year (whether in the form of a Kansas logo or errant F-bomb) is that he is so thin-skinned. He cannot stand the fact that some people don’t like him, or heck even hate him, especially when he feels they should appreciate him (see: Kansas fan base, Delvon Roe, or this poor Presby fan in HIS stadium). Fact is, as much as I can respect Grant Hill, Jay(son) Williams, or Coach K, I will ALWAYS hate them with every bit of effort I possibly can. I can’t help it and will never make excuses for it. That is just how it is. I agree with many of your points comparing K and Roy. The commercials are a wash for me, something most people won’t admit. There is an obvious difference in the “Aww shucks” Coke commercial and the endless Chevy and Amex commercials that outlasted the Devils in the NCAA tourney speaking of coaching greatness, leadership and prestige. You already pointed out the difference of the “business” approach Coach K employs, but at the end I see both as business decisions that mostly benefit each man (and their bank accounts). The score is even for me there. The profanity is a hard one for me. I understand the Army upbringing and tutelage under the General, but the key difference for me is the how you choose to live your life. I am not buying the argument that K is better than Roy because he curses constantly while Roy only has a few well-documented faux pas. The argument that you make against Roy is that he isn’t always a daggumit kind of guy and that it may just be a public perception. Having played sports most of my life, I would rather have a motivator that employs harsh language when he really wants to get your attention, rather than always being profanity-laced, but that is a matter of preference. I don’t really have a problem with either, just a difference as your title suggests, but I think you missed on the fact that at some point in Coach K’s life, he had to make a conscious decision to make daily use of his expansive 4-letter vocabulary. Maybe this makes him more intense and focused, but I prefer more personality with the ability to turn on the intensity, rather than never being able to turn it off. Your last point of megalomania is by far your weakest point. That is because your thesis is the DIFFERENCE between the two great coaches, but you only provide one side of the argument for this point (something you did well with your other points). I don’t disagree with your points about Roy, but to say Roy is a megalomaniac while ignoring K is a complete oversight and where your bias shows through. Most of the instances I excuse because ultimately the guys are standing up for their team and their players, at all costs. Both coaches have called out the fan bases in the past few years for not coming out and supporting the team during these cupcake games, even though you state that Cameron Indoor (where is Cameron Outdoor?) is always rocking and full. As a fan I agree with this because both coaches want the best environment for their team for every game. Roy’s actions on Saturday were inexcusable, but how would you compare them to Coach K’s megalomania in the 1994-1995 season? Even if the back injury was legitimate (an argument for a different time), how can you possibly justify his petition to the NCAA to have the losses erased from his personal record? There was only one motivating factor here, his own image and his own focus on the record books. I don’t know about you, but I would be extremely disappointed if my coach refused to claim my play, even if he missed half the season. That move was not only 100% selfish, but it was in direct defiance of his team and program. More examples can be seen in G’s (“the victim”) famed elbow, Laettner’s stomp, Patrick Davidson’s unexpected start and tackle of stud Chris Paul in the game’s opening seconds, to name a few. While these moments fuel my internal hatred for Duke and Coach K, at least I can respect the fact that K stood up for his players after these incidents. I vehemently disagree with his position in these cases, but can respect his constant support of his players. Roy takes a similar approach, and all good coaches of great programs should, because that is what makes kids want to play for you. Both teams recruit good kids, but they are still kids and need someone to stick up for them when they get too caught up in the moment or the celebrity. Lawson should not have gambled (even though he was of age), but Roy supported him without fail. Each coach’s support of his players, even when they make mistakes, is what makes them and their programs so respected. The big difference to me is each coach’s goals for his players. While both put winning #1, Coach K, the program and the fans often refuse to support his players if they give him anything less than 4 years (see: Elton Brand). Coach K would not comment on Henderson leaving early last year when his personal and professional accomplishments should be celebrated. All coaches would be stupid to not wish, or even try and convince, the players to stick around, but the point of college is to prepare young people for work and life outside the campus bubble. Coach K should be leveraging is Olympic experience to help get his guys to the league when they are ready, not when he wants them to go. While the fans always love the Hansbroughs and Redicks that come around once in a lifetime, its the Elton Brands, Ty Lawsons, Marvin Williams, and Luol Dengs that perpetuate greatness of these programs in this day in age. This is where Roy has separated himself from K; by focusing on personal development that will benefit the players professionally (even if that is not after 4 years) combined with getting the buy-in for team success. K undoubtedly gets the most out of his players every year, but I have not seen them getting the equal benefit. I appreciate, as always, your well-thought arguments and know I will continue to disagree politely. In the end, there is no way for the programs, coaches, players or fans to ever peacefully coexist. Add Roy’s latest tantrum to the long list of moments the rival school salivates for while the other school squirms awkwardly for justification, or at least the next distraction. I can admit that I think K is a better coach from a strategy and in-game approach (see: “Call a ! @#$ timeout Roy!” or any of our terrible inbounds plays), but I’ll take Roy 110 times out of 100 to lead my alma mater’s basketball program. Much like the difference between the Chapel and the Old Well, the Dean Dome and Cameron, Public and Private, it’s difference of style and preference that will never be shared. Thank you for an excellent response. Indeed, some of K’s actions (including the 1995 loss-vacating) are indeed megalomaniacal. The main point of the article was to point out that some of the things that K gets blasted for are also done by Roy, to minimal fanfare. Of course, the media shellacking Roy is receiving right now for the Presbyterian incident may hurt his relatively clean public image. As far as the profanity point you made, that’s definitely true. My point there was again that Roy is also guilty of cursing and outbursts. He certainly uses less profanity than K, especially during the game. I just wanted to point out that Roy is no saint or harmless country boy. Many fans already know that, of course. And I don’t have anything against any coach cursing. It’s just a style choice, as you say. As far as your ‘personal development’ argument, that’s a good point, but relatively subjective. Either side can argue that their coach produces better talent. For the last four or five years, Roy has outdone K on the recruiting trail, that’s true. The miraculous signing of Harrison Barnes is the best example. To defend Coach K, Duke currently has the most alumni on NBA rosters (14) and they are also paid the highest combined salaries of any team. That’s just the raw data—some argue that those contracts are unwarranted, but they still exist. I personally believe that K makes a tremendous effort to prepare his players for the league. As for letting players go ‘when they’re ready,’ some think that Roy discouraged Ed Davis from going pro last year, although he would’ve been a top-5 pick in all likelihood. That’s not set in stone, but it’s an interesting counterpoint. I don’t think any coach really wants their stars to go pro early. Hansbrough was a notable exception to that trend, and I think staying all four years was a combination of his particular talents and his insatiable drive to win a title and set records, etc. The 2009 title was destined to be UNC’s: that team had everything going for it. Now that Roy has asserted his equality to K with two titles in five years, we’ll see how the two spar for the remainder of their careers. And like you, I will always take Coach K to lead (what will be) my alma mater. Thanks again for a terrific post. We hope you continue to read our articles and remain a paragon UNC fan—we don’t always get such good responses from the other side. Your first paragraph pointed out the point that I did not get on my first read, but now see more clearly. Its not an argument of actions but more reactions. I see your point and agree on most levels. I think the thing that has hurt K the most in the last 20 years is the relative disappearance of a personality. In his early years he showed humor, emotion, joy, and frustration on a daily basis (ever seen the video of snaggletoothed K spelling his last name when he was first hired? Pretty funny). His success in the late-80s and through the 90s changed him into being more reserved and business-like because he and Duke were always in the spotlight. It’s hard for the general public to relate to him now because he has much more of a CEO personality (something most of us will never know) versus more of an average guy. My argument is not for which is better, but just an observation to why I think people try and poke holes in K because he has developed such a hardened public exterior. Plus, how many 62 year-olds don’t have a single grey hair? The world is just in awe, ha. I can’t disagree with your facts on the NBA players, but my point was more of the focus on providing the draft facts and supporting the player’s decisions, versus almost completely recruiting for and supporting 4 year guys. As a college basketball fan, I was pretty shocked to see how Duke and K hardly acknowledged Henderson’s early departure last year and felt like Henderson was left stranded on an island. I have yet to figure out the difference from the early part of the decade to now, but it seems K was so hurt by guys leaving early that the talent (especially with the big men) has really suffered in the last few years. It’s hard to say if K’s desire for 4 year guys has much to do with this, but in your argument of perception I think this is a crucial area in the recruits perception of Duke, rather or not if its true. The Ed Davis saga was interesting, but given that he said he was coming back directly after the Championship game, and never wavered, I think it probably had more to do with his Dad’s NBA experience, his family’s financial stability, and desire to get stronger and experience being the go-to guy for at least a year (and not become the next Marvin). Marvin was a 6th man in college and does not seem to have ever figured out how to be the man in the NBA, too bad his financial needs were different. He is a solid player, but not quite the #2 pick that he was. No coach ever wants his players to go, but supporting the players should always be the priority. One thing I know we can share, though, is at least we can be glad that we don’t a guy like Calipari at the helm. I enjoy Final Fours and NCs to give them up after 2 or 3 years. Good luck with exams, see you in February with our “Quite Please” signs. 1. K had back surgery in ’95. Back surgery. BACK SURGERY. There is no “another time” for discussing the legitimacy of his departure that year. 2. Duke, not K, decided ahead of time that the record for the balance of the ’95 season would be Gaudet’s, and this decision was in line with precedents from other situations where the head coach had to leave for the remainder of the season. So there was no “petition,” it wasn’t K’s decision, and there was no “removal” of losses. 3. I don’t think the OP meant that K’s cursing is better because he does it more. What a silly interpretation. No, that point was more about the consistency and trustworthiness implied therein. Roy falls back into using profanity often enough that it really can’t be excused as isolated incidents where something he overheard from some angry Pepsi drinkers behind ye olde general store slipped out. It happens enough to create a serious contradiction, and that speaks to his integrity and trustworthiness. Good posts Raymond, and I really enjoyed the article Jake. To speak to Raymond’s point about the perception of K’s reluctance to encourage or support draft early-entry, it is just that, a perception. There isn’t anything actually substantial to back up that claim. But alas, as Ray also points out, perceptions can be damning regardless of accuracy. In some camps that is a generally held opinion of K, with a lot of people believing it for no other reason than they want to, consciously or unconsciously. That sort of thing is used against K and Duke when recruiting, make no mistake. When you look at the raw data, which Jake has provided, Duke clearly puts guys in the league at a rate on par with or above every single other team in the country. Yet they still must battle that perception. Also, I can understand, to an extent, the backlash (or what is left of it after 14+ years) in regards to the 1994-1995 season. But, I always boil it down to the simplest terms. K was ill, and people who argue otherwise are just delusional. But more to the point, K did not actually coach those games, therefore, why should he be assigned the wins or the losses that occurred during that time? Again, he was on a sick leave from the team, and he was not coaching. He should get no credit from what transpired at that time, regardless of how positive or negative said credit is. Again, good posts by all, and I enjoyed reading them. Raymond: I agree, we can be proud of our coaches knowing that they don’t stoop to the level of Calipari to win. Rather, win and then have those wins vacated. Dattier: Those are useful clarifications. The 1995 season was a dark period for us with K out of the coach’s seat. JDev: I agree that the ‘perception’ of how K handles draft-ready players is used against Duke in recruiting. I think all he has to do is point to the overwhelming success of Duke guys in the pros to dispel that rumor. Just last night Dunleavy, Redick, and Boozer had fantastic games. Brand is coming off an injury and still contributed 11 and 7 to the Sixers win over the Warriors. Corey Maggette had 24 in that one as well. If anyone wants to argue about Duke not performing in the NBA, they’re living under a rock. Regardless of how K guides his players, a good deal of them end up making the very difficult transition to the league, and becoming stars or solid contributors. Thanks for all the feedback on this article, everyone. That was a great article, and all the responses were very good responses. Raymond, you are definitely one of the most rational, practical Tar Heel fans around. I’ve never been able to understand the love affair with UNC and Roy, either. It infuriates me to no end. Duke and K, on the other hand, are loathed by just about ever non-Duke college basketball fan. I am a UNC fan. Okay, that is out there. 1. Getting upset over cheering, the one thing the Crazies are most known for, is unfathomable. For the most part I actually agree. 2. The media is finally scrutinizing Roy and UNC, after years of hating on Duke. I can understand this to an extent, especially from the print media and blog media – mostly people that jump from scandal to scandal. The true basketball media has always crawled over both Duke and UNC, and that will never change because they rely on this rivalry and the collective greatness of these programs to feed the popularity of the sole sport they sell. 3. Off the Heels (pun intended) of 2 Championships and with the recruiting win in Barnes, Duke fans NEED a way to enjoy a UNC failure, no matter how minimal in the long run. I am not going to get into any of the discussions of who is the better man. The reality is any reasonable fan can point to singular incidents all day long, but at the end of the day know they are doing this out of hatred (and a little bit of admiration) of their rivals greatness. This rivalry has had its cycles of greatness with each team and will continue to have them. The one point that I don’t think many non-UNC fans realize is that Roy has always hated negative cheering at his home court. As I student, I remember countless times where Roy got on the mic to scold us when chants of minimal things like “Overrated” started in the risers. Roy always wants the complete focus to be on positive encouragement from the fans rather than attacking the other team. He has proven time and again that he will scold the UNC fan base in the Dean Dome when the focus becomes negative, so I was not at all surprised to see him do so for a fan of the opposing team directly behind the bench. Again, I don’t necessarily agree with this, and know a fan base dedicated to coordinated and overwhelming cheers probably thinks this is absurd, but I just wanted to provide a bit of perspective to again how our coaches and programs differ. Do any Dukies out there think that the public perception of these differences actually has anything to do with the fact that the public may not like the “business approach,” “military approach,” or “authoritative approach,” or does the argument always come back to the fact that you guys were so good during a time when TV coverage of college basketball exploded so people just hate you being good? Personally I lean mostly to the first and some to the second, mostly because there are many great programs that do not have the national hatred that Duke gets, but they all get at least some hatred from greatness, it comes with the territory. You can look at UNC, KU, UCLA and UF as recent examples and throw in UK for the historical perspective. I am just curious because you all seem to have more perspective than the other Duke folks I know. Thanks for the chance to discuss. Your final paragraph on whether K receives the negative attention because of his “military” approach is interesting. I think I would say that K’s seriousness makes him seem like a jerk or a guy who can’t take a joke. He actually has an excellent sense of humor. When it comes to his team, I think he takes it personally and takes responsibility for how Duke plays and appears to the world. I don’t think we’ll have any “Late Night w/ K” type dancing and skits anytime soon—and that may be K’s mindset. But you’re right—Duke is on TV a lot, and people get tired of seeing the same team win over and over again. I certainly understand that. Being hated comes with the territory—something I noted in the first few paragraphs of this article. I may be a little biased here, but I think the media tends to celebrate UNC’s greatness a little more than Duke’s. That’s just my opinion. Everyone knows that Dickie V loves Duke. Honestly I think he just likes whatever team is good at that moment. And for now, that will be both of our teams. Thanks for your response, and I’m glad you enjoyed the article. My point of the respect and the greatness of the rivalry is show here. While on not the same scale because we were not playing, it reminds me of the awesome act of the Duke students after the tragic murder of Eve Carson. We can hate on each other all day long, but at the end of the day this is what defines our collective greatness. It’s great to see Roy make that gesture. Indeed, both of our programs come together in tragic times like this and after Eve’s death. I know Andre appreciated that, as did all Duke fans. Coach K “refusing to support” any of his players is a new one on me. The guy is known for his loyalty. What a crock of crap. You “Crazies” have some mighty short memories. First, “What would happen if Coach K had pulled this?” Nothing b/c it would never happen. HOGWASH!! IT HAS HAPPENED!! But the “nothing” part is correct. The full correct answer of course is that “nothing would happen b/c K would manipulate the media with intimidation & threats to make sure no one would dare print word one!” Of course, I’m referring to the incident when Scott Williams (yes, Roy’s son) yelled down to Coach K as he was trotting to the locker room at halftime that he “had (ACC Official Larry) Rose in his pocket!” Coach K immediately had security EJECT Williams from the game. Where was the NATIONAL MEDIA on that one? Oh that’s right, Fayetteville’s Weirder wasn’t sending out emails to ESPN, SI & the other “big boys” to make sure they checked out his blog! Truly, Duke & Coach K aren’t despised b/c OF THEIR SUCCESS. Remember, BOTH were the media darlings for it. Both saw their admiration turn around b/c of how they handled their success with such classless arrogance. Also, lost in the facts of this unsigned “Crazies crap” piece is that the guy was NOT a “Presbyterian Fan”. He was a DUKE FAN who happened to be a student at Presbyterian. Also, he DID NOT produce a ticket for his seat, but rather one for an upper level seat. Also, the video clearly shows that the Duke fan & Roy had a rather lengthy & heated exchange! Remember, the Duke fan CLAIMS that he only said “Don’t miss it, Deon!”, but the video evidence clearly suggests that he said MORE! Think logically people, would Roy REALLY have a fan tossed IF that’s all that was said? No way. Finally, this caught fire for 2 reasons. 1) Roy was naive to think that he was being “classy” when he refused to share the specifics of the exchange & thought that it would die there, NOT KNOWING that Deon & Larry Drew would later provide soundbites BRAGGING that their coach had the “pull” to get someone ejected (You Dukies want a story, investigate how those 2 got into UNC w/out functioning brains). And, 2) Weirderer who wrote the official AP story of the game (which was actually quite tame on the incident) went into OVERDRIVE with his blog slamming Roy & other members of the MEDIA for not POUNCING on him. He PERSONALLY contacted the aforementioned “big boys” to make sure HE got credited nationally for “breaking” the “Roy has fan ejected” scoop, & when Roy offered finally offered an explanation 2 days later at his weekly press conference, Weirderer didn’t even bother to attend. Yet when he saw some of “Roy’s explanation” in the media, he went on the attack AGAIN telling others in the media to “NOT BELIEVE IN ROY!” And THAT is about as UNPROFESSIONAL as it gets! There IS a big difference between Roy & K in terms of who has more class. But the biggest difference between the 2 is in “understanding how to manipulate the media”!! BigJohn, I find it hilarious that you visited our site, read our article, and spent at least ten minutes writing a 535 word paragraph in response to a post that was written over six months ago. But that’s ok. You always have 82-50 to think about. Thanks for visiting!